Perfect for removing dead skin on feet! 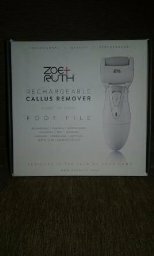 I recently purchased Zoe+Ruth Foot File Callus Remover for Dry Cracked Dead Skin on your Heels and Feet. I have a lot of dead dry skin on the bottoms of my feet and really love to go for an occasional pedicure but that can get expensive so I decided to try this out. It shipped very quickly and arrived well packaged. 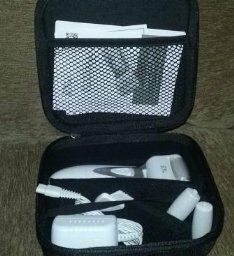 In the box was a zippered carrying case with a handle, the electric callus remover, roller grinding head, two refill roller grinding heads, and international charger, a cleaning brush and instruction manual. You can use this on wet or dry skin. I like to use it after taking a shower because the skin is already soft and easier to remove. You do not have to apply pressure when using it just use light slow strokes across the skin. After using it is easy to clean; just run it under water and use the cleansing brush provided. Treatment is to be repeated 1-2 times a day for about a week until you see the results you want and after that just use it once a week for maintenance. 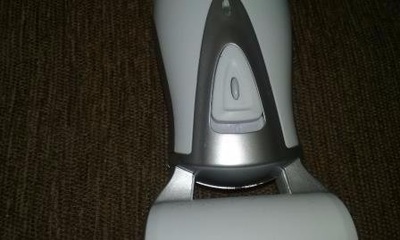 The callus remover is very easy to use. 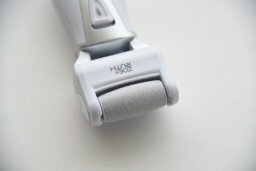 No more ruff filing with stones and scrappers that can damage your heels and take a long time to complete. It comes with a rechargeable battery and charger so you don’t have to worry about replacing batteries. 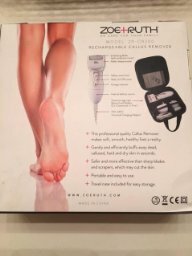 I think this is a very nice product, it works very well, and my feet have not looked this nice in a very long time. I would definitely recommend it. I did receive this product in exchange for my honest review. I get no rewards or penalties for reviewing either positively or negatively so opinions given can be taken at face value. 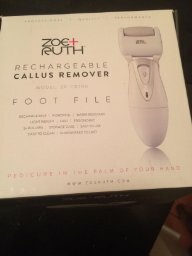 I long-awaited my new Zoe+Ruth rechargeable callous remover foot file. Arrived in a nice box and inside the box with the black zip case that held the manual directions the actual foot file charger and two refills. The first thing I did was I opened up the manual to make sure that I was using it right, because a detailed description of what each name of every part is there's no confusion. 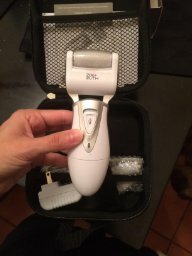 What is what, this callus remover is only for the feet and heels but I put it along my hands to feel how rough it was and surprisingly it was not rough I first I doubted the fact that it would be able to deal with my cracked feet from all the sand running that I do but I was willing to give it a shot. I read all of the important mornings including keeping it out of reach of children and not to disassemble the device which I never would've done anyway. Before using the file I charged it for about 10 hours overnight and then used it the next morning the manual said that it would last 30 to 45 minutes I actually ran the file down until the battery died it was about 47 minutes straight. One thing that the manual says is do not charge the appliance for more than 16 hours I wonder if you forgot it in an outlet with the battery be dead because you overcharged it? Before I used it on my feet I took a shower and make sure that I didn't have any open blisters when I finally applied it to my fee I noticed that if you press too hard the roller stops and if you don't press hard enough you're not filing your feet so you kind of have to find the perfect pressure to get the most out of the file. The on off switch is very easy to use it's a large button and then I followed the how to clean section of the manual which is really as simple as unplugging it wiping it off with the cleaning brush and rinsing it underwater. 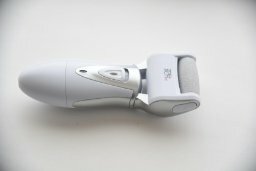 (editors note:) It is suggested not to charge the Callus Remover for over 16 hours at a time purely for the fact that if you continue to over charge it, it may deteriorate the life of your battery - therefore it is just a recommendation, it shouldn't need more than 10 hours at a time to ensure you get a good full charge on it. This is a fabulous product I have tried so many Callus remover's because my feet are pretty rough from running in the sand but I can never find one that applied the correct pressure the roller file on this one was the perfect rigidity I didn't feel like it cold or ruined my skin I would definitely recommend this product to anyone who's looking for a file for their feet that is not overly harsh but this one is easy to use I would think that I would have to use this roller to her three times in a row to notice a huge noticeable difference but I would expect that because this is a gentle roller. 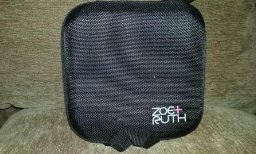 I have tried a couple of the Zoe and Ruth. Product disappointed there always top-of-the-line and made of the best high school in material. These are my honest opinions. I have been using a different callus foot file that runs off of batteries. While it worked some, it just was not getting the job done. 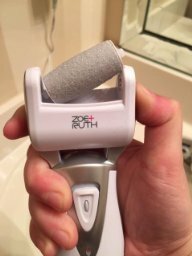 I have to use it for long periods of time every day to see any results. 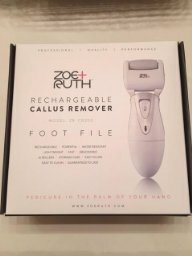 This Callus Remover Foot File by Zoe+Ruth is amazing! It plugs in to charge it up so I don't have to worry about buying batteries and changing them every week. 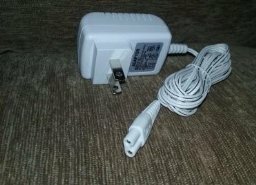 I usually use this while it is plugged in and the motor is the perfect strength. It does not bog down when pushing it against my skin. The first time I used it, it only took about 5 minutes for each foot. The second day it only took 5 minutes total and the same the third day. So now I just have to do maintenance once a week. I have to say my feet look and feel so much better. This comes in a nice hard shell carry case with a handle. It zippers closed and protects the machine very well. It also comes with two extra replacement rollers, a hard plastic cover to put on the machine when not in use, and cleaning brush, and of course the cord. The cord is a pretty good length so I don't have to worry about sitting so close to an outlet when I use it. But, it doesn't have to be plugged in to use it, that is just my preference. This is a great product to smooth your feet and make your feet feels amazing Great. I love the ways it feel when it finish taken all the callus off my feet. The picture shown while I was doing it . 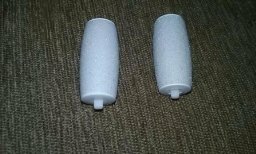 I recommend because it makes the feet feels smooth, doesn't hurt at all while you having it works on your feet and filed great. I love that it can be rechargeable and a brush to clean afterward. My mother was eager to get a hold of this when she could. She has been looking for something to smooth out her feet with. She has been using the pumice stones and the ped egg even to try and get her feet to feel smoother. Well she can stop looking now. This callus/dry skin remover really works and she loves it. It comes with enough head replacements to last a while and we love how it can be rechargeable. The first night that we got the callus remover, we charged it right away like the instruction manual said. She made sure not to over charge it. When it was time to use it the next day, my mother soaked her feet first and to dry them after she was done to make it easier to remove the actual dry skin. Right away when she used it, we saw and felt a difference. She told me that she will continue to use this because she absolutely loves it! It comes with a cute carrying case to carry all of its necessities. 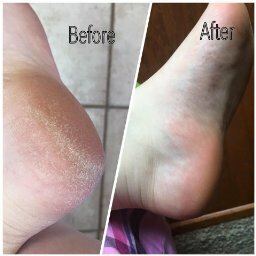 Based on my mother's and my own experience with this callus/dry skin remover, we definitely recommend this to anyone to keep your feet feeling smooth! Summer shoes, here I come! 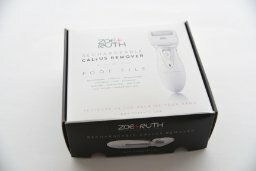 I was able to try out this foot file callus remover from Zoe+Ruth. I have an Amope Wet-n-Dry, but my mother decided that she liked it and I haven't seen it since it was delivered. 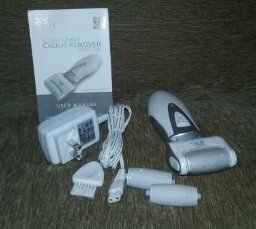 But, it was a blessing in disguise because I have been using this callus remover for about a week and I'm seriously amazed at the results. Rough feet run in my family and it gets embarrassing to the point I don't want to wear sandals in warm weather. After a week of using this everyday my feet are so soft and I can wear my sandals and heels without feeling self conscious. I absolutely love that it is rechargeable instead of taking batteries. 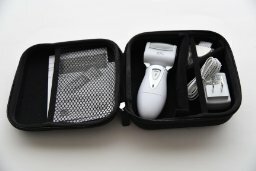 With your order you get the callus remover, charging plug, cleaning brush, and 2 replacement files (3 total), and a handy carrying case. The files are super course and my calluses were no match for them! The brush helps to keep the unit clean and hygienic. My feet have gotten so much better and I love how soft they are! They still have room for improvement, but they have gotten so much better after just a week that I can't imagine what they'll look like in a month. I do have to warn you that you don't want to stay on one spot for too long. You want to glide over the whole area, because you'll wind up rubbing a raw spot. I had a really bad spot on my heel and stayed on that area a little too long and I could feel the skin getting hot. As long as you don't linger more than about 2-3 seconds it shouldn't be a problem though. 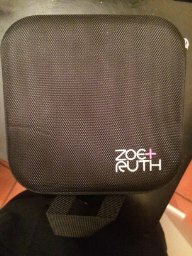 I have reviewed products for Zoe+Ruth before and they are one of my favorite companies now. If I ever have a problem they are more than willing to make it right and they are all so nice. I received this item in exchange for an honest review. I did not receive monetary compensation and my opinion is based on the product after using it daily for over a week. I have only ever used my mothers callus remover foot file before. I always really liked that one as it did a great job for moving calluses. So I decided I wanted to get my own. When I saw this when I absolutely fell in love with it. 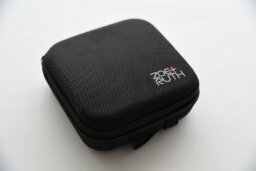 It comes in this great travel case. It also comes with all the rollers you need. It feels great on your foot. It is not too hard or too soft it does a great job with the move and calluses without causing any pain. I have nothing but good things to say about this. It would also make a great gift for someone as it comes in the cute travel case. 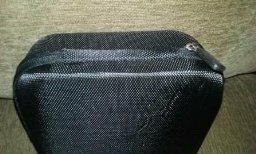 This callus removes is made of good quality. i have another brands and this one is better for sure. It comes with a nice case to keep everything in order. It comes with 3 rollers. Easy to use. My foot are ready to summer!